Birmingham and West Brom have been relegated from the Premiership after Portsmouth beat Wigan 2-1. Birmingham could only draw 0-0 with Newcastle and are now four points behind Portsmouth with one game to go. The Baggies play West Ham on Monday but are nine points behind Pompey with only six points available from two games. Blues boss Steve Bruce said: "We knew it was a tough job and did everything possible. When Shay Given denied us at the end we knew it just wasn't to be." Pompey's 20 points from their last nine games assured their survival. 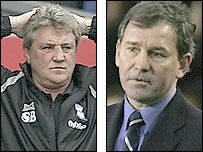 But West Brom and Birmingham have each struggled throughout the whole campaign. Bruce added: "We still thought we were good enough to stay up. Our supporters were fantastic but unfortunately we failed to deliver for them. "We had to beat a Newcastle side who have been on their best run and were very confident. We worked our socks off but it didn't go for us. "We've enjoyed our time in the Premiership and this is where the club needs to be. "It's a big job for whoever it will be to try and lead us back and there's a lot of work to do over the summer. I hope I can do that but now is not the appropriate time to talk about it." The Blues mounted a late surge after they held champions Chelsea to a goalless draw at St Andrews on 1 April. They went on to beat Bolton and Blackburn while earning a point after draws at Wigan and Everton with their only defeat in the last seven games coming at derby rivals Aston Villa. But their efforts have proved too late in a season during which their injury problems have had an immensely damaging effect. West Brom escaped relegation on a dramatic final day last season but there was no great escape this time, with a lack of goals proving their biggest downfall. Their last win came against Blackburn on 4 February and they have earned just three points in 10 games since that victory.